Roy Wood sprang into social media life on Friday to confirm both the special guests for his annual Rockmas event at Birmingham Symphony Hall on Sunday 2nd December and also the full roster of twenty one (21) dates between Saturday 20th October and Thursday 20th December for this years Roy Wood Rock & Roll Band Winter Tour, which for the first time in eons will not be calling in at The Robin 2 this year. Yours Truly KJS still hopes that Woody might sneak one in. 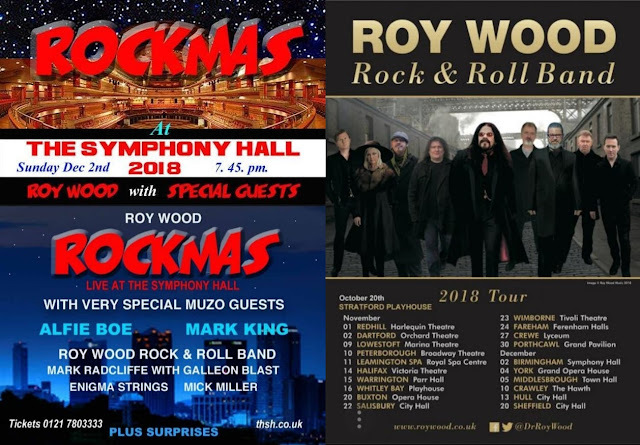 elobeatlesforever (elobf) recommends the Roy Wood Rock & Roll Band to those enlightened folks who enjoy the music of ELO, Jeff Lynne, Wizzard, The Move, The Idle Race, 'Brum Beat', The Beatles and related artistes.